The Buzz on Backdoor Roth IRAs | Financial Designs Inc. Being an independent contractor provides financial flexibility including the ability to save substantially for retirement… and subsequently enjoying a significant tax break. Some of the basic tax-deductible retirement accounts available for 1099 physicians are covered in a previous blog. For those wanting to make higher tax-deductible contributions, hiring a spouse is a nice strategy to consider. Another TAX ADVANTAGED option is a backdoor Roth IRA. Despite the name, this strategy is completely on the up-and-up with the IRS, and allows you to save an extra $6,000 a year*. How does a Roth IRA differ from a traditional Roth IRA? A Roth IRA requires you pay tax up-front ON THE CONTRIBUTION; however, the future gains and withdrawals are tax-free. That’s a nice benefit when it comes time to make withdrawals in retirement. The downside of a traditional Roth IRA is there is an income limit. Roth IRAs are only available to those whose adjusted gross income is below $203,000** (married filing jointly) or $137,000** (single). Utilizing a backdoor Roth IRA is a little more complicated, but it allows you to get around the income limit. So what is a backdoor Roth IRA? A backdoor Roth IRA is a conversion of a Traditional IRA to a Roth IRA. 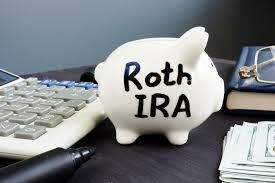 There are no income limits to convert Traditional IRAs to Roth IRAs. As a reminder, contributions to an IRA are pre-tax (and withdrawals are taxed). In the most simplistic form, a high-income earner (who surpasses the above Roth IRA income restrictions) would deploy this strategy by making a $6,000 deposit to A NON DEDUCTIBLE IRA and then convert THAT SAME AMOUNT to a Roth IRA resulting in tax-free future gains and withdrawals. You can do the same for your spouse resulting in $12,000 of deposits. The key to making this above strategy work efficiently is to ensure you don’t have many IRA assets. As an independent contractor, you may want your retirement assets in an individual 401(k) rather than a SEP IRA. When you have too many IRA assets, you may pay more in taxes which can make this strategy a financial disadvantage rather than an advantage. There is a fairly complex pro rata tax calculation that makes this determination. Work with your financial adviser to discuss your specific scenario and where this strategy might fit in your plan.